The Indian Ocean is full of islands and archipelagos that will take your breath away any time, so if you have been planning a vacation to this area you will love the New York to Seychelles flight for $1,250 r/t with taxes we have just found. 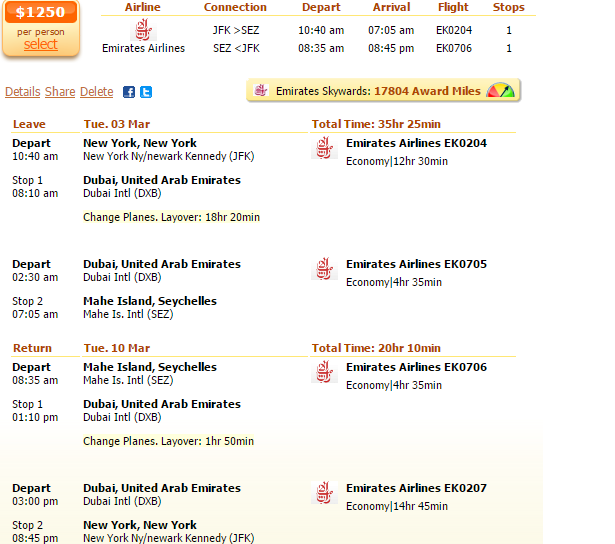 Fly with Emirates Airlines and save nearly $200 compared to any other airlines we have checked. The offer featured in this post can be booked on Faregeek, though we have found it on Travelgrove. Start your search here but check other merchants too and see if they have cheaper flights from New York to Seychelles. Depart on your trip from John F. Kennedy International Airport (JFK) on March 3 and return from Seychelles International Airport on March 10 2015. You will have one stop in Dubai both ways, an 18 hour 20 minutes one on your way to the Mahe Island of Seychelles and a 1 hour 50 minutes one on the way back. The airline’s frequent flyer program, Emirates Skywards, will give you 17,804 award miles for booking this fare. While the Emirates airfare costs $1,250 r/t, the next best fare, a multiple airlines flight, costs $1,444 r/t, exactly $196 more. Check all the best flights from New York to Seychelles we have found and choose one. This entry was posted on Saturday, December 27th, 2014 at 3:33 am and is filed under Airfare Deals. You can follow any responses to this entry through the RSS 2.0 feed. You can leave a response, or trackback from your own site.